Dr. Essam Elkordi, the President of Alexandria University received Mis. Elizabeth White, the Director of British Council in Cairo and Mis. 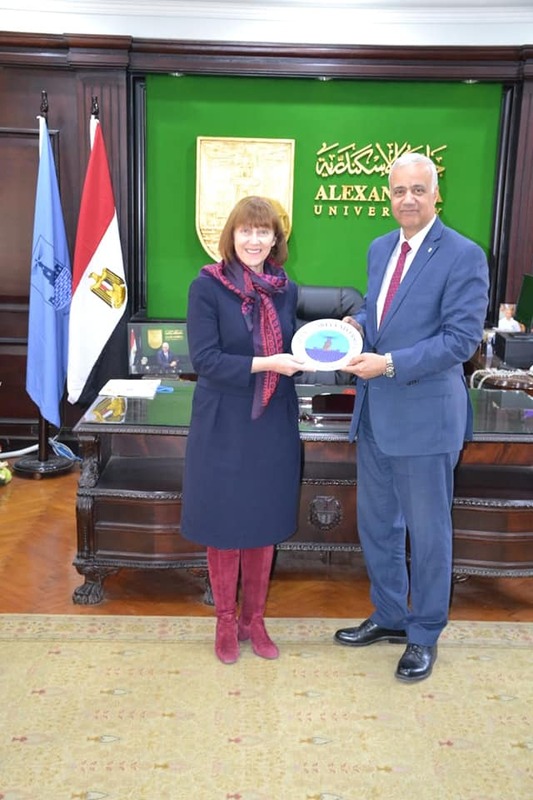 Neveen Abaza, the Director of British Council in Alexandria for strengthening collaboration and scientific exchanging between Alexandria University and British universities especially in medical, engineering and data technology fields. Dr. Elkordi emphasized that Alexandria University looking forward to cooperate with British universities research and innovation fields. 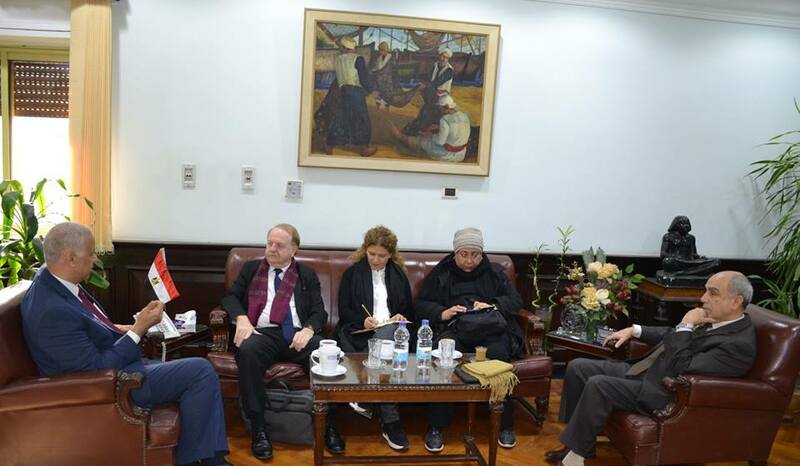 He added that the university will receive delegation of University of Manchester in England to sign number of joint cooperation agreements. Mis. White mentioned the British Council's establishment ceremony for 80 year in Egypt and the council efforts to cope with the Egyptian society needs through various initiatives in scientific and research field. The meeting was attended by the Vice President of University for Education and Student Affairs Dr. Hisham Gaber, Vice President of University for Graduate Studies and Researches Dr. Mokhtar Youssef and Dr. Gihan, Vice President of University for Academic internationalization and International Cooperation. The President of Alexandria University Dr. Essam Elkordi and University Deputies received the Secretary General of the Euro Med Cities Network Mr. Bernard Massabo to discuss ways of joint collaboration and exchange experiences in innovation fields. They also discussed joint collaboration with Niece in establishment of smart cities innovation centers to meet Alexandria residents' needs. Dr. Elkordi emphasized that Alexandria University is looking forward to conduct many cooperation agreements with French universities and cooperate with Euro Med Cities in the proposed project and provide academic support in many fields. Mr. Massabo declared that the project was adopted by Union for Mediterranean and financed by French Development Agency under the frame of cooperation with Mediterranean cities generally and Fes, Tunis and Alexandria in particular. 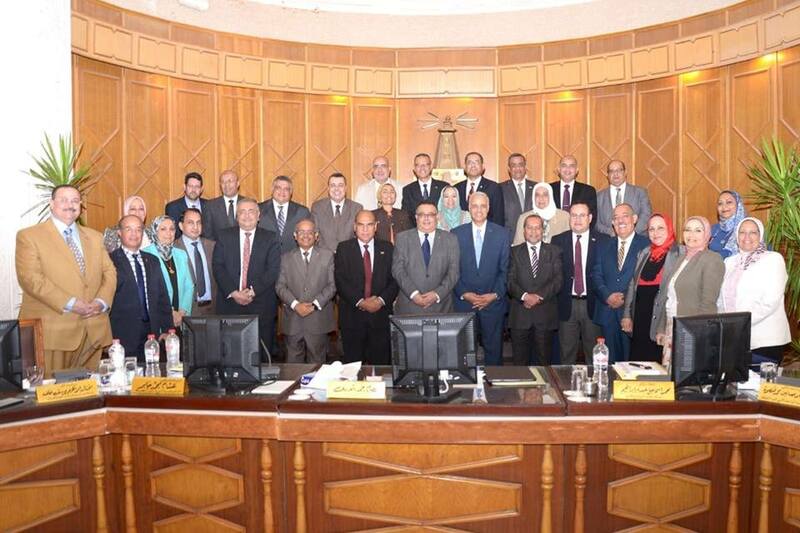 Dr. Essam Elkordi, the President of Alexandria University declared that Alexandria University achieved progress on Webometric index in January 2019 to rank second among Egyptian Universities after Cairo University and 1126th position in the global ranking.Dr. 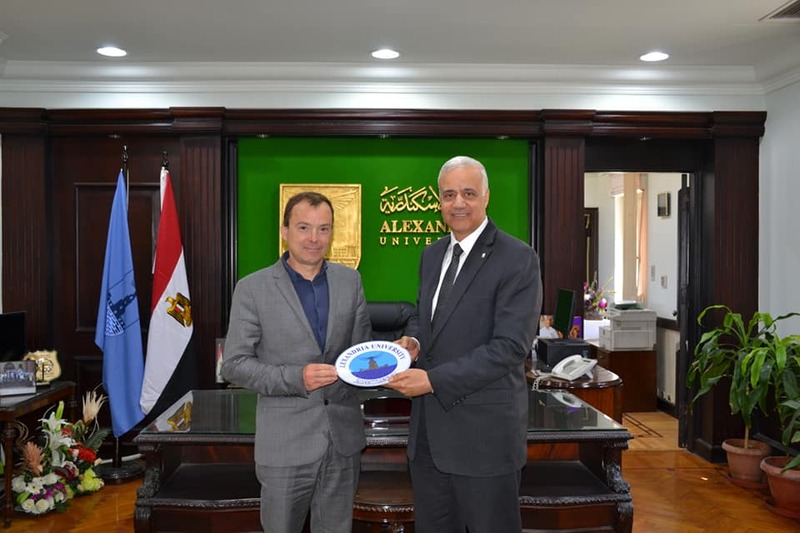 Essam Elkordi, the President of Alexandria University declared that Alexandria University achieved progress on Webometric index in January 2019 to rank second among Egyptian Universities after Cairo University and 1126th position in the global ranking.Dr. Elkordi added that Alexandria University were in the top of list among the international universities. He pointed out that classification is released in January and July of every year. He expressed his hope to raise university ranking in the near future by providing more information about university online according to the standards of Webometric site. It is worth to note that Alexandria University achieved advanced position in this classification in 2009, 2016, 2017 and 2018.Dr. Elkordi declared that Alexandria University has recently witnessed an increase in the scientific publishing, where the medical researches represents 25% and engineering researches represents 20% of the total researches while 53.5% of the researches have an involvement from world universities through the period 2015 - 2018.The rector said that the university awarded the researchers by raising financial incentives of scientific publishing and supporting the scientific publishing in the scientific magazines indexed in Web of Science list. He added that there is strong cooperation with the Egyptian Knowledge Bank to upload some Egyptian magazines in the bank portal. 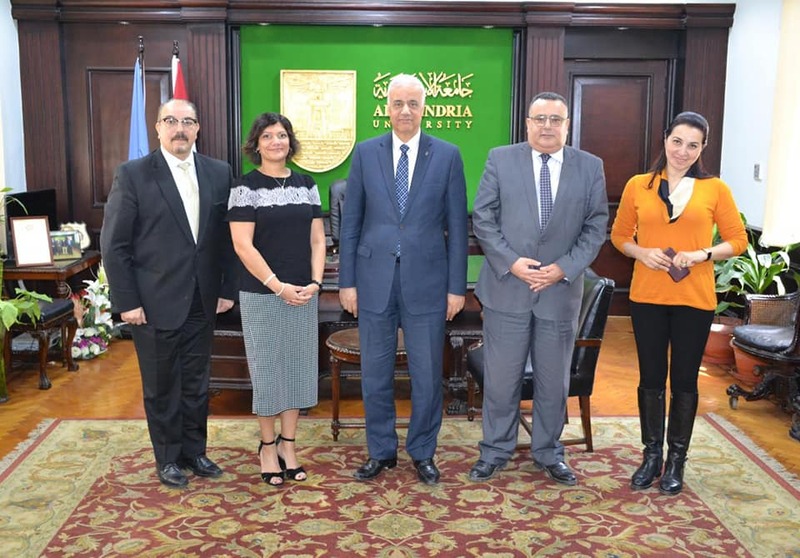 Alexandria University discuses creating joint programs with "Canadian Chardin"
The President of Alexandria University Dr. Essam Elkordi receives the University delegation of Canadian Chardin to discuss cooperation methods and create scientific degrees by joint programs. Dr. Elkordi stated that cooperation agreement was signed to start executive steps in creating these programs. The two parties agreed to provide summer courses for students in cooperation with Siemens Company. The meeting was attended by the Vice President of Alexandria University for Education and Students Affairs Dr. Hisham Gabr and Dr. Gihan Goifel, the Vice President of university for international cooperation. Dr. Essam Elkordi, the President of Alexandria University received the delegation of International Organization of the Francophone headed by Mr. Irvine Sabourin, Regional Director of Organization in the Middle East office to review organization activities for developing students and researchers' skills in French language at the university's faculties. Elkordi appealed for more scholarships and Francophone programs which the organization can provide them to Alexandria University. Mr.Sabourin emphasized that the Francophone Organization looking forward to provide Organization's members countries with activities and cooperation scholarships for more benefits.